I received a message the other day to expect a houseguest, a special friend coming for a visit, someone with deep needs. Since I love giving and love my friend, I was excited at the prospect of helping out in any way I could. Knock, knock, knock! Yikes! I’m not ready. However, I opened the door anticipating my friend but found a dirty beggar asking for a handout. Sorry, I said. I’m busy. Try next door. Knock, knock, knock! Aha! Must be my friend! Opening the door, this time I found a member from church collecting canned goods for the hungry. Sorry, I said. I’m busy. Try next door. Knock, knock, knock! Now what? Irritated, I flung open the door and found a neighbor’s child collecting clothes for homeless children. Sorry, I said. I’m busy. Try next door. After everything was finished, I was pooped so I sat down to rest. Looking at my watch, I began to wonder what happened to my friend who was in such need. Doesn’t she know I’m waiting here to help her? 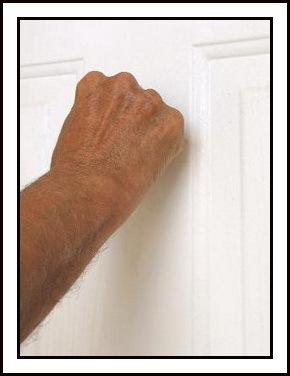 If He knocks upon your door today, will you open up to welcome Him as your honored houseguest? How will He appear, as the dirty beggar, the church member, the child? Or maybe as the person sitting in the back church pew crying, the young father with small children and food stamps, the neighbor down the street dying of AIDS, the single mother working two jobs to feed her children? Who will you welcome? Whose needs will you meet? i guess we just don’t always see the needs right in front of our eyes. Lynn…I think if we knew Jesus would be coming over, our “homes”, our “lives” would be far different. This reminds me of a cartoon I used to show my students “Martin the Cobbler”. It is based on a short story by Leo Tolstoy Where Love is God Is. Well said. I think we so often worry about doing big things that we forget to meet the little needs right in front of us. Nance Marie, thanks so much for visiting. Haven’t seen you in a while. And you’re right…we just don’t see what is before us sometimes. Appreciate your comment. Blessings to you! David, so true, so true! Too bad we don’t realize He is coming! I am honored to have you visit. Thank you so much! Blessings to you! Helen,, I’ll have to look that up. Thanks for that and thanks so much for kind comment. I appreciate it. Bless you! Thanks so much for the visit, Matt. I am honored. I appreciate your visit and comment. Makes me heart happy! Bless you! Thank you so much for stopping by, Hazel. So nice to *see* you! Your comment is appreciated. Bless you! Beautiful and so completely necessary for us to hear this in our busy lives. Thank you for sharing this. Thanks for the reminder to meet needs where we find them! As always a deep thought to keep us on our spiritual toes. He does come disguised, and it is up to us to pay attention and respond. I loved the analogy and the story. Really hit home. Thanks for sharing, Lynn. That is an excellent example of how we can serve Jesus by helping others and a good reminder that He may not come in the form we expect! Patricia, thank you so much for stopping by. I so appreciate it. You bless me! Blessings to you! Sheila, thank you and you’re welcome! I’m so happy you stopped by. Bless you! Aw, thank you, Ceci! You make my heart very happy. Blessings to you! Hey, sweet Connie! Thanks for stopping by on your birthday! Hope you had a great day! Bless you! ← Fresh Air? ← Are You Full of Dynamite?